April 21 may be an ordinary day for most people, but for Katherine and Jay Wolf it is a day to celebrate her life, the anniversary of the day Katherine nearly died of a massive brainstem stroke. This year, on April 20-21, 2018 she will spend the event’s 10-year anniversary at Falls Creek Baptist Conference Center, near Davis, Okla., as one of the keynote speakers for the Baptist General Convention of Oklahoma’s Women’s Retreat. 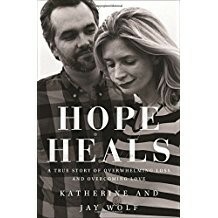 The Wolfs story can be read in the unique and powerful book Hope Heals: A True Story of Overwhelming Loss and an Overcoming Love. Hope Heals, published in 2016 by Zondervan, is the story of the Wolf family’s arduous and achingly slow eight-year journey surrounding Katherine’s catastrophic brainstem stroke, survival and recovery. The book is written as a duet, a pairing of talented writings from both Katherine and Jay’s perspectives. The Wolfs want people to know they are not alone in their pain. This is a book for the suffering, the disappointed and the one whose life turned out completely different than what was expected. It’s for the one looking for hope. It began as a fairy tale life in California. The Wolfs were both headed toward promising careers. Katherine, a 26-year-old model in the entertainment industry, and Jay, on his way to taking the bar exam for a career in law, had bright futures. They had a 6-month-old baby and were deeply involved in their church community. Their tragedy resulted in Katherine spending 40 days on life support and two years in full-time brain recovery. The result was a severely disabled body including the removal of 60 percent of her cerebellum. The book includes a detailed account of the Wolfs’ story while getting a glimpse into their understanding of suffering. Why does God allow misfortune? What is our hope truly in? How does one rely on and trust God? The Wolfs share that if hope is rooted in an outcome, then expectations will crush us. In redefining many areas of their lives, they have come to the conclusion that hope is rooted in God. Today, the Wolfs have a ministry to the hurting and encourage people to celebrate their lives, even if it looks different from the one that was expected. For more information go to www.hopeheals.com.